Anne passed away unexpectedly at Seven Oaks Hospital on Monday, December 3, 2018 at the age of 89. She was born on the family farm near Morden, MB. 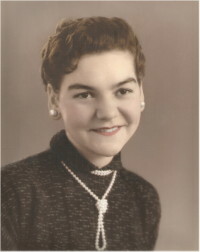 She was predeceased by her husband of 53 years Peter in 2016, as well as her siblings Kay, Walter, John and Pete. She will be lovingly remembered by her children Corinne (Paul) Zillman and Cam (Jill), and grandchildren Clinton, Victoria, Lauren and Andrew. She is also survived by her sisters Helen and Bette, and brothers Ken and Ed. A Funeral Service will be held on Monday, December 10 at 11:00 a.m. at Elim Baptist Church, 645 James Avenue, Beausejour. Corrine and Cam, l’m so very sorry for your loss. I have such fond memories of Auntie Anne…every time l look at my piano, l think of her and how she tried so hard to teach me to play! She’ll be greatly missed by all who loved her…sending love and prayers to both of you, and to your families. Corrine, Cam and Family. I am so sorry for the loss of you mother and grandmother! She was a wonderful woman… Time passes away so quick, and its unfortunate that the last time I saw her was when I went to the hospital to spend some time with her when she had surgery. She was SO excited to get back to bowling. She had a wonderful spirit and will always be missed. Much love from all of us. Corrine and Cam , I’m so sorry for your loss ! my Aunty Anne will be greatly missed by all of her family ! I remember Her smile it would light up the room and I remember her laugh like it was yesterday ! My very sincere Condolences on the passing of your dear Mom. I have known her a number of years through Morning League Ice Curling and then sort of lost track for a bit and reconnected at Floor Curling at the Sungro Center, and was so shocked to see the obit in the Paper today, as it seems like we just spoke to one another a week or two ago. She was a very nice lady and will be missed by many. May she rest In PEACE. My sympathies on the passing of your lovely Mom and Grandmother. She was a beautiful person and I always enjoyed having a little visit with her. She had a lot of inner strength and a great love of music. May she Rest In Peace. So sorry to hear about your mom’s passing. She was my teacher in Mason School. I loved to hear her play the piano, especially the song “Robin’s Return”. She motivated me to become a pianist. Thinking of you. She was my ValleyField School teacher. I remember her father moved the small cabin to the school , where Anne and Helen lived. I remember her as the only teacher who did not spank me. She was such a soft hearted person. Just good memories of her. Years later her husband Pete was our fastball coach. They were the best ! !